We’ve entered the Twilight Zone of the Holiday Season. We’re sure you’re familiar- Halloween is over, and all of the sudden its all about Christmas. Malls are starting to have Santa available for children to chat with, your local easy listening radio station is playing carols, and you’re halfway through making your gift wish list before you realize that Thanksgiving hasn’t happened yet. It happens to the best of us. Kristen and I have it particularly bad: our apartment looks out over our school’s arena, which is currently hosting a holiday carnival, complete with ice skating, ferris wheel and non-stop Christmas music. It legitimately sounds like we live inside a Pandora Holiday Music station from 8 pm – 2 am every day. To keep ourselves in the right frame of mind (and from going insane), we decided a Thanksgiving shenanigan was in order. If for no other reason than to remind us that it’s still November. 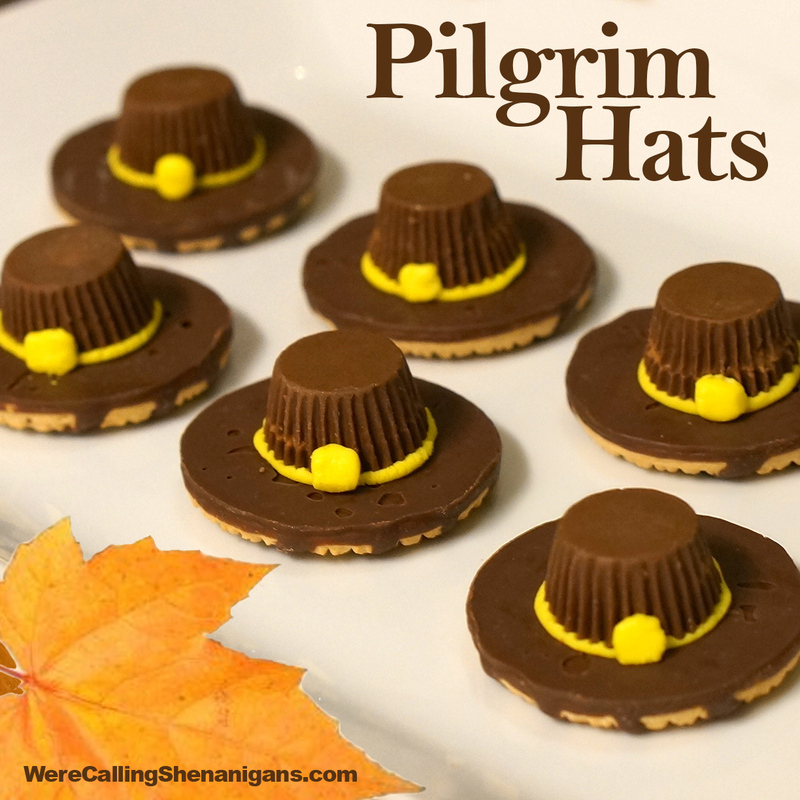 We found these adorable pilgrim hat treats on Pinterest and thought they fit the bill! First lay out your cookies face down (chocolate side up). 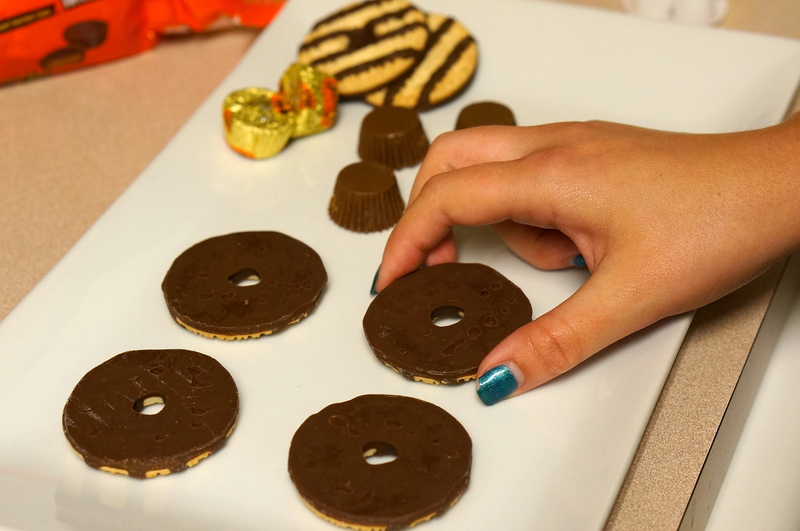 Now, unwrap as many Reeses as you have cookies. 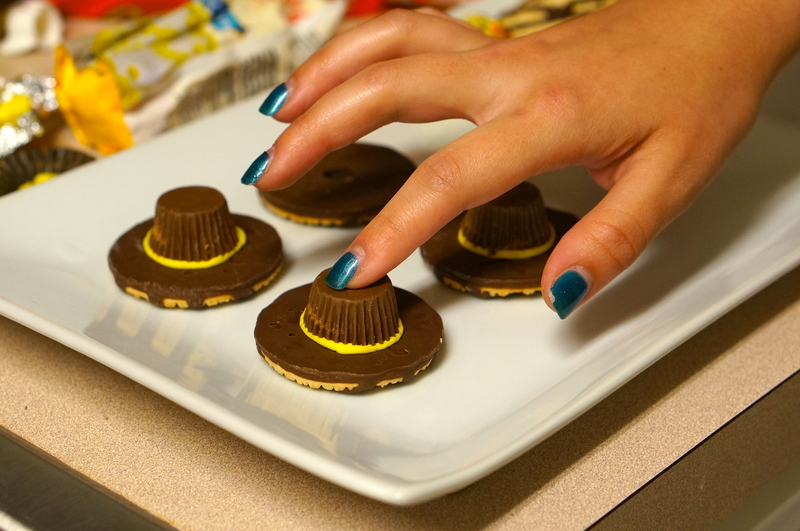 Spread a layer of yellow icing on the top of the Reeses cup. The icing should barely hang off of the edge of the Reeses cup all the way around. 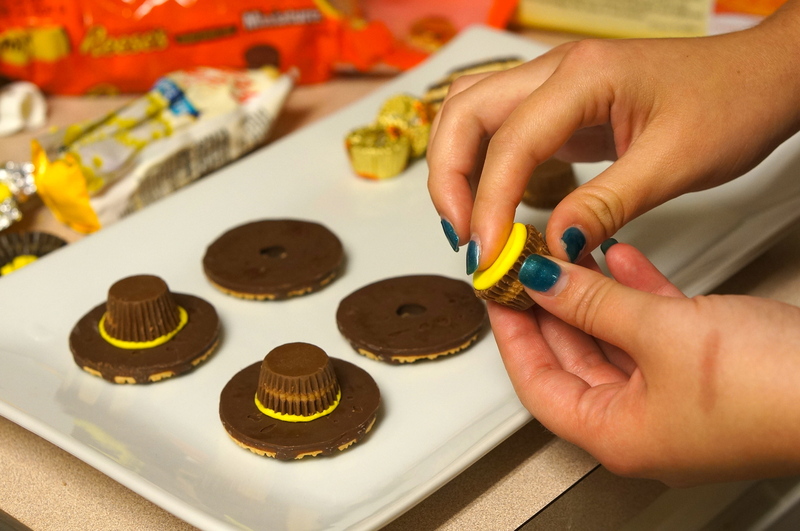 Press the icing side of the Reeses onto the cookie. 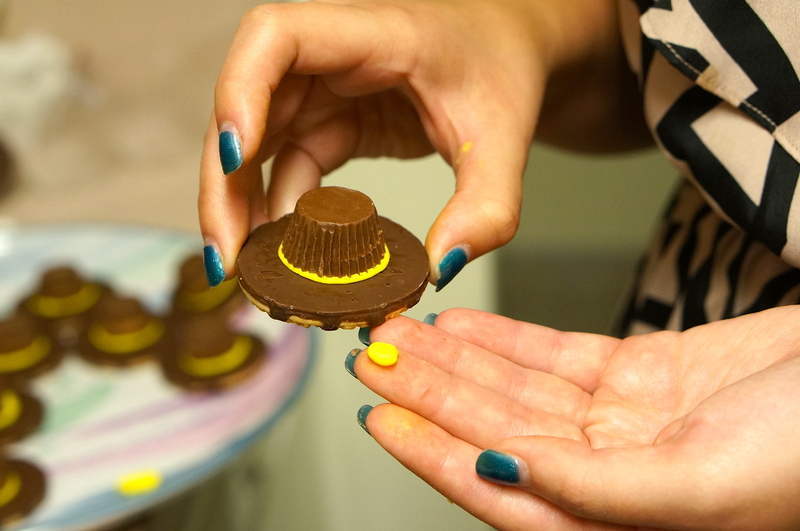 Now make a square “buckle” out of your yellow icing and press it to your hat. We thought this shenanigan was pretty awesome. Easy, quick and adorable- it’s all we really want! Plus these are a nice way to remind yourself of what we celebrate when we gather around for our Thanksgiving feast: just like the original Pilgrims, we’re lucky to be able to sit down for a full meal among people we love. Adorable! Looks fun and easy for all ages! 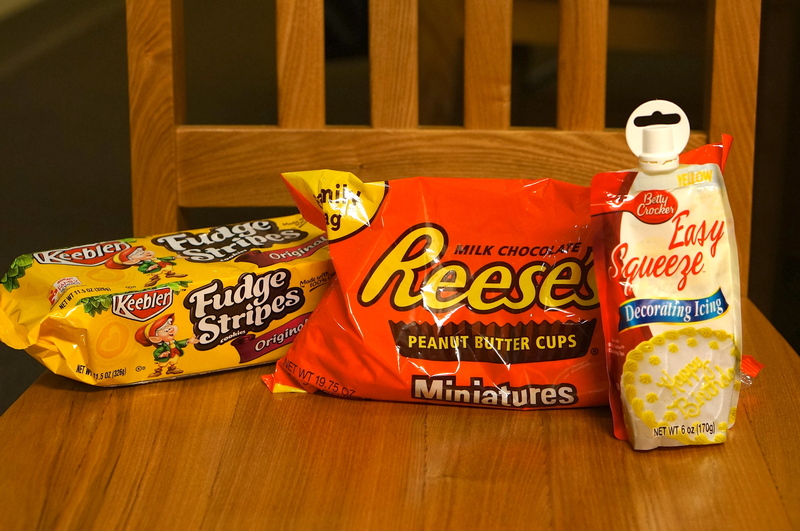 These will make a great addition to the Turkey Treats you posted last year! Luv them!